For more than 130 years, we have built a global presence with service centres and partners in nearly 100 countries and key marine harbours. This offers you local expertise, supported by the global breadth and depth of Alfa Laval. Whether you are looking to make critical changes in your operations or just need service for a small component, we're here to help you – from simple advice to complex troubleshooting analysis. 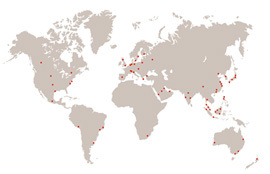 Alfa Laval service centres are strategically located around the world. At these modern facilities, everything required to prolong your equipment's life is made available to you. Alfa Laval's own specialists at our materials and chemistry laboratory helps you stay competitive by providing materials and chemistry knowledge, whether it be for media or application testing, advice on chemical products or material selection for your Alfa Laval equipment. We also help you meet requirements regarding local and global standards as well as demands within hygiene and environment. When disturbances occur, our experts can help identify the root cause of the issue through competent testing and analysis – preventing it from happening again.